Anyone who owns a NES or a Genesis knows the art of Marc Ericksen. Those who grew up in the ’80s and ’90s may well remember his art as a part of their childhoods, a permanent link to the era and all the great games that kept them up late and from doing homework. Ericksen has been making game art for almost 40 years, and he is responsible for some of the most well-known pieces of the 8- and 16-bit eras. 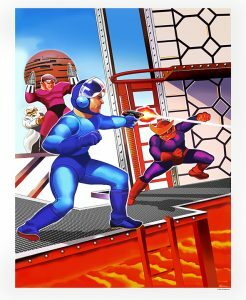 Some of his instantly recognizable piece include the box art for Strider, Bad Dudes, Mega Man 2, Thunder Force II and Steel Empire. He also did the art for Capcom’s promotional poster featuring Captain Commando. 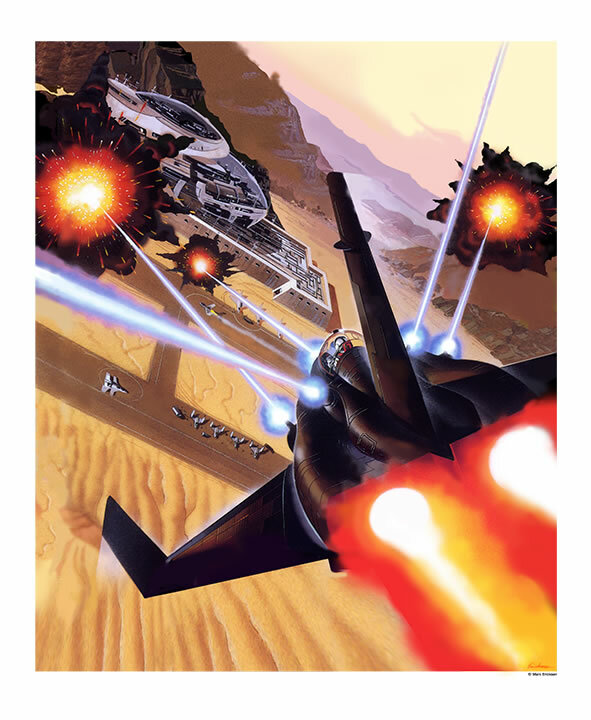 With a variety of styles, Ericksen has maintained a giant presence in the video game industry, creating almost 150 pieces, including box art for 90 games. Sega-16 was fortunate to speak with Mr. Ericksen about his experiences creating game art. Sega-16: What made you decide to become an artist? Marc Ericksen: I really wasn’t qualified to do anything else. My dad was an Air Force officer, so I was raised was in the military. I left High School in 1965. Without the means, or frankly, the grades, for a university, I went to Sacramento City Junior College for one semester, dropped out in 1966, and was promptly drafted into the U.S. Army. I spent six years on active duty and spent two of those years in action in Vietnam. So, when I left the service in 1972, I was 25-year-old veteran, a high school graduate, and a civilian for the first time in my life. I was responsible for supporting my wife Dianne and our infant sons Christian and Richard, and my only useful skill sets involved field stripping and firing every NATO and Soviet weapon known to man. But there WAS my drawing… as a child, I had always loved drawing. I was pretty good and had drawn all through my teens as well, but I hadn’t drawn anything through the prior six years in the service. So, I thought, What the hell, and decided to apply to an art school. I created and sent a small portfolio of six drawings and six paintings to Art Center (in L.A.), Pratt Institute (in N.Y.) and the art department of The University of California, Berkeley. Pratt and Art Center accepted me, and U.C. turned me down based on my high school grades. Thank God. I’ve since learned that University art schools are fairly useless for learning practical illustration. I chose Art Center College of Design (ACCD) because of its great reputation and never regretted it. 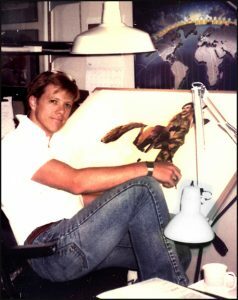 They gave me credit for time in service, and based on the portfolio, allowed me to bypass some basic figure drawing classes. Even with the GI bill funds ($115 a month), my freelancing professional work as a student, and Dianne working, we still ran out of my savings from the military about halfway through and couldn’t meet the payments. ACCD encouraged me to continue and gave me a work scholarship, and with that help, I got my BFA with honors in 1975. The instruction was phenomenal. Sega-16: How did you get into making art for video games? By the time the ‘80s came, the tech bubble was going crazy, and I was freelancing on my own out of North Beach and was working with groups like Intel, Varian, and Coherent Technologies, as well as companies like United Airlines and Clorox, when I got a call from a group named Broderbund. 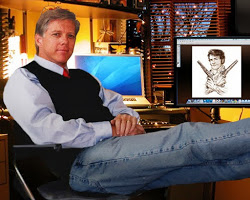 They were creating early stage video games for platforms like the TRS-80. I wound up doing covers for a half-dozen of their earliest games. The money wasn’t great yet, but the artwork was a blast to produce. They would give me carte blanche to come up with anything I wanted, as long as it was fun and exciting. Once the Broderbund art was on the shelves, I began getting inquiries from other game companies. Between 1982 and 2002, I created over 95 game covers for 30 different companies. Throughout those twenty years, I also continued doing illustrations for major corporations, toy companies, and publications across the U.S.
Sega-16: How do you prepare for creating a piece? Do you play or read about it beforehand? Marc Ericksen: The process worked best face-to-face with the creative team at the companies that called me in. With Broderbund, I worked directly with Doug Carlston, the founder and an extremely creative person. But because I never had the time to actually play the games, I always required that they be played through all their levels by an employee while I watched the screen and questioned the gameplay, and as I sketched ideas and concepts right there with the team. I loved my life as an illustrator, but I had never had so much fun with it as I did in gaming. Sadly, I was never capable of gameplay. When my own boys tried to teach me, I would be dead in a snap, over and over. They thought it was hilarious; I thought it was pathetic, but when you think about it, 30-year-olds were not playing these games, 12-year-olds were. The saving grace for me was that few of the 30-year-old graphic designers I was working with could play them either. The software guys were mostly under 25. Often, the person they would bring in to play the game for me were in their teens! Sega-16: Your NES art used a variety of different styles, and one would be inclined to believe several artists were responsible instead of just you. Was the changing styles your choice or dictated by the company you were creating the art for? Marc Ericksen: I had always cast a broad net regarding the accepting of jobs. I did technical cutaways of tech gear and processes, cartoons, tight renderings in air brush, loose illustrations done in pastels and watercolor, black and white work in pen and ink, and paintings in oils, all for printed work. I also did what is referred to in the trade as Preliminary Art: storyboarding work and comprehensive sketches for all the major advertising agencies and design firms in the S.F. Bay area. So, the constantly different looks sort of characterized what I so enjoyed in illustration. And no, no one ever dictated a “look.” It always seemed to develop organically based on the sort of subject matter was involved… no one ever complained. Sega-16: You created the iconic art for Mega Man 2 for the NES? How did that come about? We set up a meeting to watch the gameplay and to sketch. It was at that fateful meeting that I queried one of the attending art directors in the employ of Capcom America, asking him a simple question while watching the gameplay: “What is that he (the tiny pixelated icon that was Mega Man) is firing with?” His reply was: “I don’t see a rifle… so… give him a pistol.” I sketched in a pistol, and the rest is history. For Professor Wiley he just said “put a professor there“ but did not explain that there were two professors. I sketched the wrong professor, and no one corrected me. I’ve taken a lot of flak surrounding this art, but it doesn’t take a genius to recognize that the concept of an illustrator jamming through a rogue illustration without the notice of hundreds of corporate viewers through sketch, color rough, finished art, and reproduction, and numerous press checks and color proofs, and then receiving a warm thank you and a fat check simply doesn’t fly. And also, what freelancer would torpedo his career so pointlessly? I only created what Capcom America instructed me to create. It came as no surprise that within a year Capcom shut down Capcom America and resumed running the company from Japan. My last point is a poignant one: For their huge re-release of a beautiful and exclusive Mega Man 2 this year, Capcom recognized how much the art meant to Mega Man 2 fans, that they did not change a single item in my original image. That spoke volumes to me. 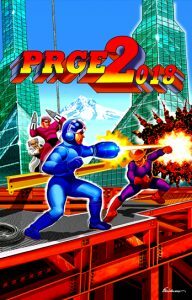 Sega-16: You’ve mentioned all the errors in that piece, and you debuted the “corrected” version at the 2018 Portland Retro Gaming Expo. How was it received? Marc Ericksen: The organizers of The Portland Retro Gaming Expo (PRGE) asked me to create a piece of art based on Mega Man 2 for the 30th Anniversary of NES. I agreed, and we celebrated Capcom’s great Mega Man 2 as a symbol of the impact of NES. We worked very hard to promote the game and NES with an illustration that corrected the errors of the original and incorporated the spires of the Oregon Convention Center, as well as construction currently being done there. It was used on the hang tags for the attendees as well as the exhibitors. The art was very well received, and I signed all comers)! 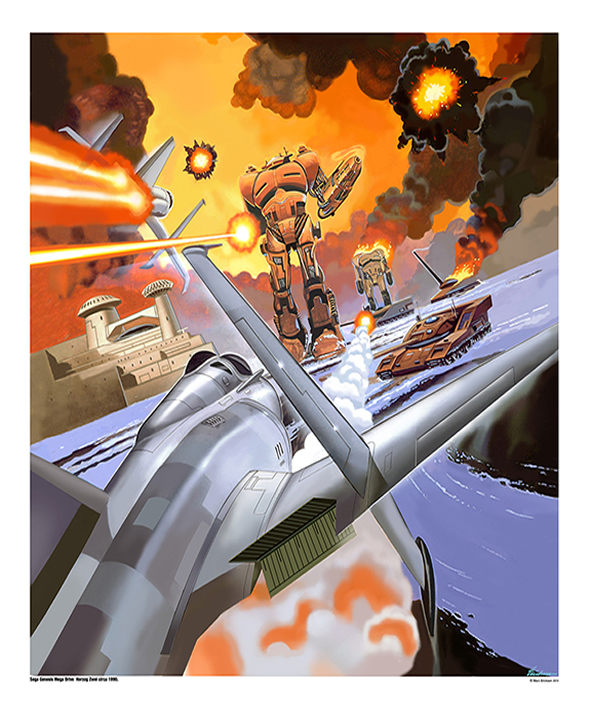 Sega-16: You began creating artwork for Sega Genesis games with Thunder Force II, beginning a long collaboration with the company. How did you come to work with Sega? Did the company approach you or did you reach out to it? Marc Ericksen: There was a mix of operating patterns among the large gaming companies. Many had in-house design groups, and others relied on outside design firms. I never needed to approach prospective clients when it came to gaming. To my great fortune, I was constantly over-employed. As I related earlier, I always had more than enough work, I think to a large degree due to my flexibility in styles and design. Sega seemed to work with a number of outside design firms, who would design the graphics and arrange for printing, point of purchase ads, etc. The work I did for Sega came through groups like Jaciow Design in San Jose, for G-LOC, Hankins and Tegenborg in New York for Steel Empire, and Michael Patrick Design in Palo Alto for Thunder Force II. Sega-16: You mentioned to me that there was a story behind the covers for Herzog Zwei and Thunder Force II. How were they related? Marc Ericksen: I’ve always harbored a memory of being told Thunder Force II and Herzog Zwei as being “brother” games. I’m not sure, but I believe the original call I received from a designer at Michael Patrick Design named Dan said he was instructed by Sega to ask me if I was available to create the art for a new game called Herzog Zwei (German for Duke 2). Sega wanted me specifically due the fact that I had illustrated the box art for Thunder Force II. A representative named Anna at Sega needed ten days to procure a 16-bit unit and the beta versions cartridges to play at our sketch meeting (these details are from my work log). By Monday the 29th 1990, I made another notation indicating the art was due by that following Thursday. They requested that I create the view from behind an attacking aircraft for the Herzog cover, much as I had done on the Thunder Force II cover. If you examine the art for both below, you can easily see the similarities. Sega-16: Which was your favorite Sega cover to create? Why? Marc Ericksen: G-Loc was one of my favorites. The interior of the cockpit posed such a challenge, and I was really happy in the way it turned out, but I loved them all. Steel Empire, and Super Baseball 2020, Thunder Force II ,and Herzog Zwei were all right up there in my affections. What great games! Sega-16: Were you ever given any specific demands for art for a game by Sega (or any other company)? Marc Ericksen: Short of giving the kids an exciting visualization tool for what were essentially entertaining pixels of brightly colored icons, I never in 90+ pieces of separate art had clients ever demanded anything but fun and engaging art. They were often in a hurry, and with my jammed schedule my life at times got chaotic. I spent many nights working until daylight to make deadlines, but that was always my decision. I never turned a game box art job down. Sega-16: Are there any Sega covers you would have liked to have illustrated? I know you did the cover for the NES version of Strider, and I really wish you could have done the Genesis version! Marc Ericksen: As busy as I was, I’m afraid I never really thought in those terms. I liked pretty much every game I got to do, I guess I had my hands too full to be looking at other possibilities. I really appreciate your feelings for the Strider art. Thanks! It was a lot of fun to do. Sega-16: Have you been doing appearances and sales at game conventions over the years? If so, how has the fan reception been to meeting you in person? Have you been surprised at their reactions? Marc Ericksen: Actually, the only show I attend is PRGE, which Dianne and I have a booth and have attended each October since 2012. The last thing I suspected was that the fans would ever care who did the art. The reception I have had at PRGE from retro game fans has been nothing but amazing. Conversely, online, there’s been a lot of painful vitriol fired at me over the issues surrounding Mega Man 2. As a man raised in a different time than the young kids I did art for, I find today’s forms of internet interaction allow voice to far too many of the small-minded and foulmouthed. My campaign of trying to get the truth about the creation of the Mega Man 2 is finally beginning to spread, and there are many who no longer blame me. The shows allow me to interact actual men and women who as children loved the games I created art for and express their heartfelt gratitude in real time as real people… that’s my most respected gift! And by the way, my Sega prints are among my highest selling prints, along with Mega Man 2! We greatly appreciate Mr. Ericksen for taking the time out for this interview! For more information about his work and how to obtain prints of his art, check out his website and print gallery. In the meantime, check out the gallery below for some of his most famous pieces for the NES and Genesis!